We're making another jewelry project today. 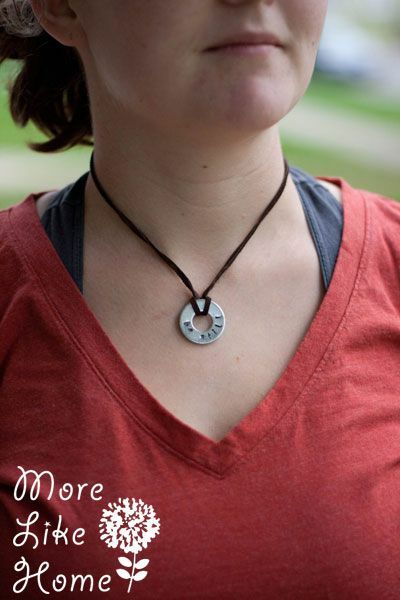 This one is really fun and easy to personalize. 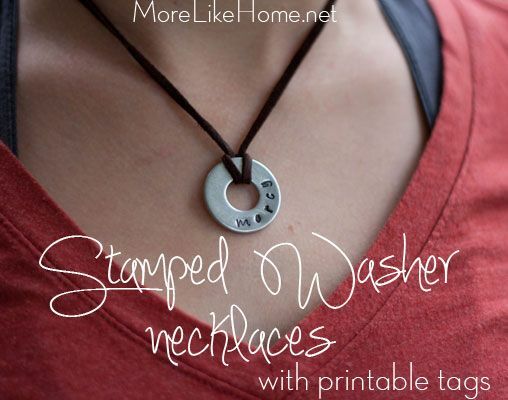 It's a stamped washer necklace! 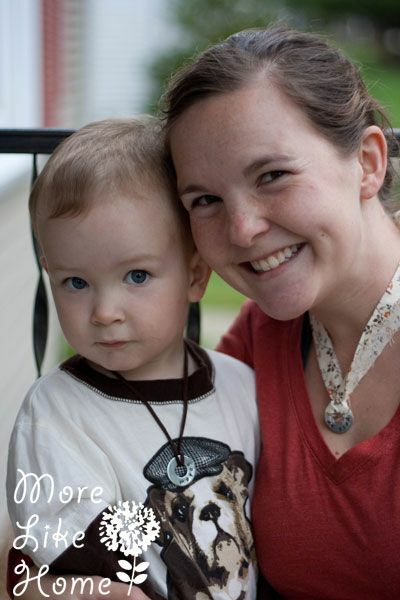 These are cheap and easy to make, and they're cute to boot! My favorite thing about them is that you really can make them say anything! I'll be showing several style ideas today. 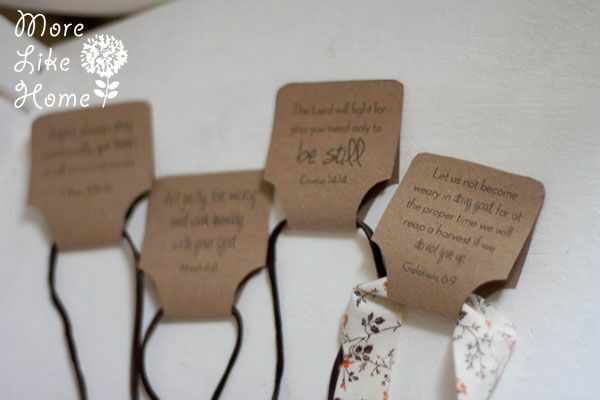 And I even have some printable tags you can use as inspiration! You can do names, important dates, inspirational words... just about anything! There are lots of different kinds of letters and fonts at a variety of price points. My red set is capital block letters & numbers ordered from Amazon (you can get them here) for $15. The blue set is from Hobby Lobby and is lowercase letters (no numbers in this set, but I prefer the font!) with a handwriting font for $12 with a coupon. So I have a good variety with just two sets. You generally have to buy different sets for capital, lowercase, and numbers in each font so it can add up if you want a complete set. Okay, let's get started. 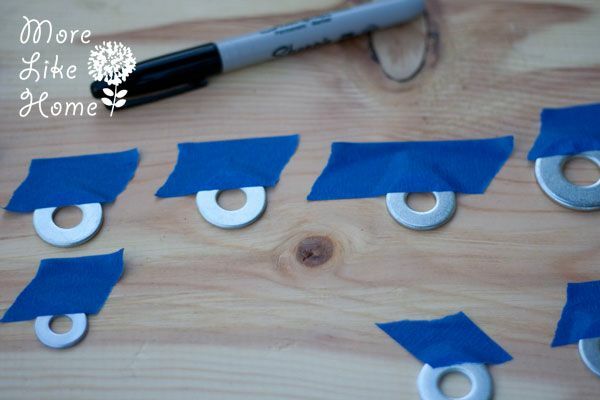 First you'll want to tape the washers down so they don't shift. I started on a board, but the board bounced too much and I had better luck taping them straight on to the sidewalk. 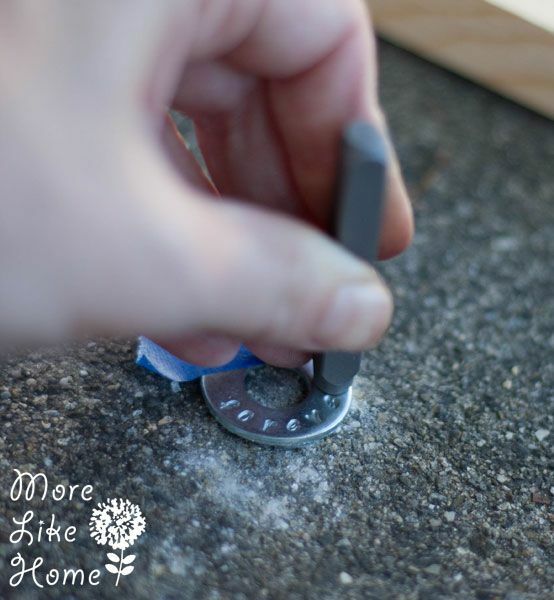 Use a hammer to pound the stamps on the washers to spell out whatever you want. It takes a little practice to figure out the spacing and get the letters straight and even. Here is one with the letters stamped. If you like the words more subtle you can leave it like this. But if you want the words to pop more you can color over them with a sharpie then quickly wipe off the extra. I had the best luck doing one letter at a time because even doing just one washer at a time gave the sharpie enough time to dry that it was harder to wipe off the extra. 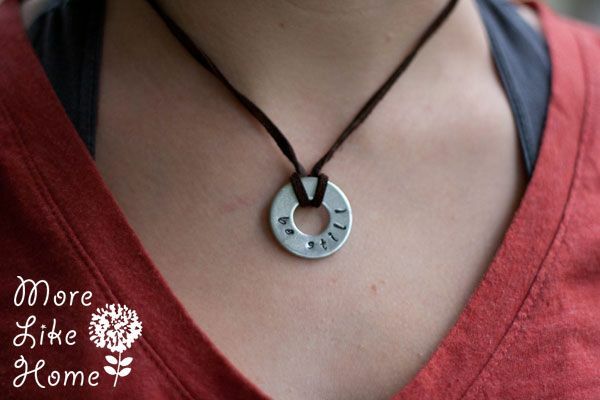 Once you're happy with the words, just put the washer on a necklace. I really like the look of deerskin cord with the washers. I also did one on a metal chain (also pretty!) and one on a strip of scrap fabric (I'm a little more on the fence about that one). As far as what to have the washers say... 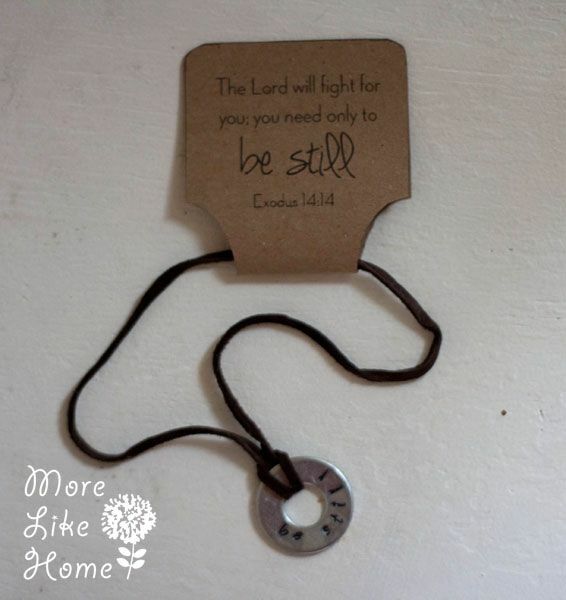 I picked a few favorite bible verses and stamped the key words. I made the tags to go with these. 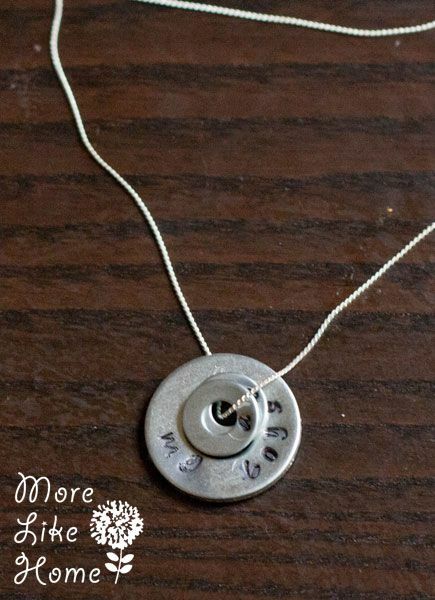 :) I also have some farther down with family names, but you could also do anniversaries or birthdays! There are 6 different tags so and I tried to pick verses that would give you multiple stamping options. 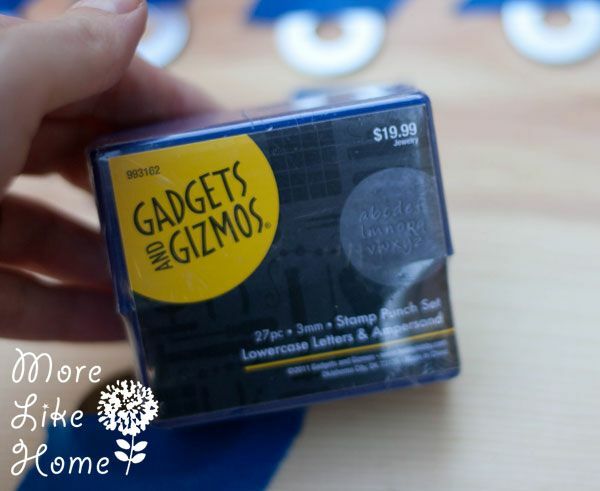 You can download the printable tags here. Then wrap it up and pass it on! 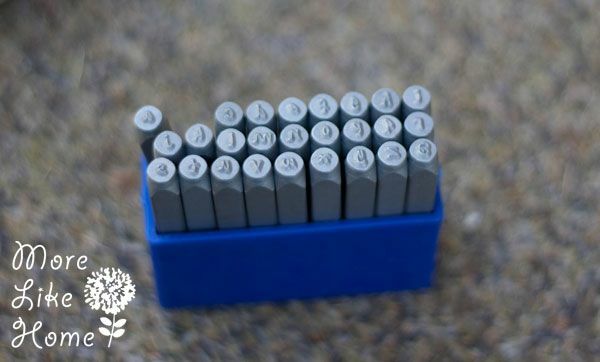 There are lots of other ways to use the stamps too. 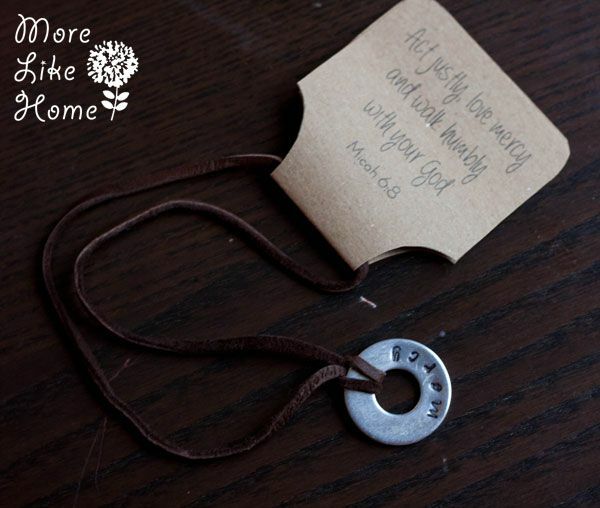 For one of the verses I used a big washer and a smaller washer to make a double layer necklace. 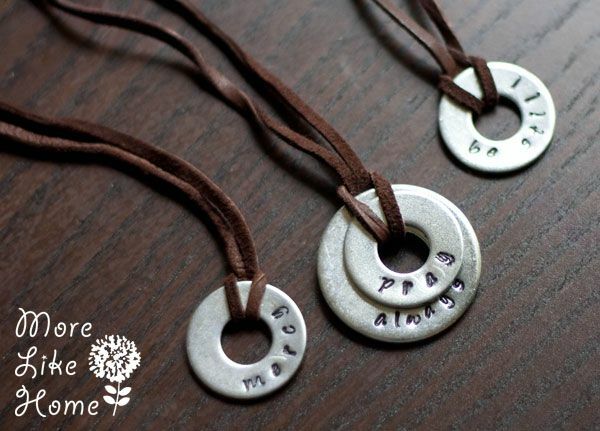 I also made a smaller double layer necklace that says "n & g" on the smaller ring and "forever" on the bigger one. I'm not super happy with the "&" from this set though. It looks a mess. I'm going to try this one again because I LOVE the idea, but the execution wasn't my best. 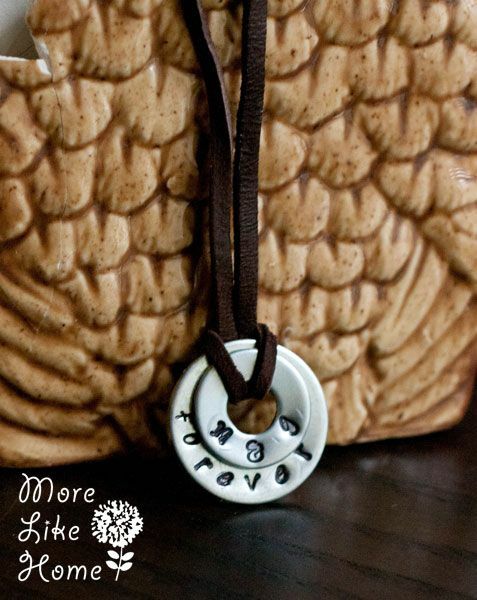 This one says "my boys" on the big ring and then has their initials on the smaller rings. Love love love it, but the "my" turned out sloppy. Boo. $2.50 - pack of multi-size washers. I still have more than half the pack left. 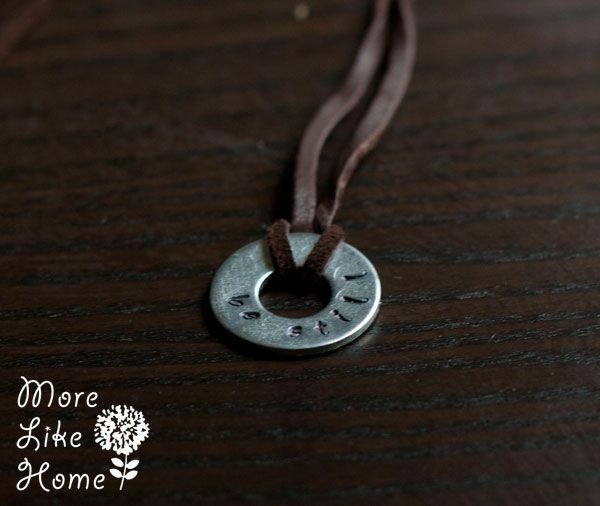 But apart from the stamps, which you can use over and over, I actually spent less than $1.00 per necklace for the deer skin ones, and probably around $2.50 for the one on the chain. That's a great deal for some personalized stocking stuffers! And now for your B story: I was out on the porch taking pictures of these (I always wonder if the neighbors think I'm weird). 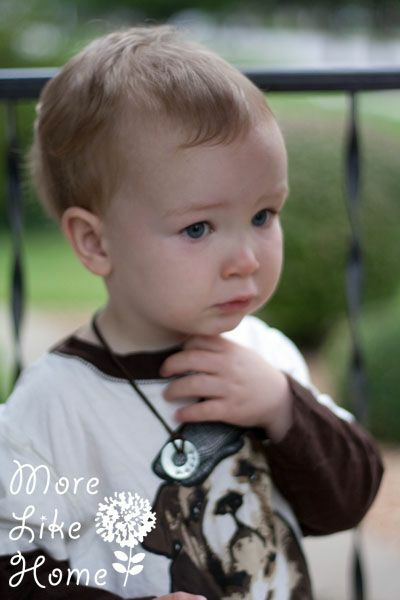 And B came running out with a necklace to help. So I put it on him. But he seemed a little iffy on what to do next. "I'm so cute and I can't help it. You are defenseless against me." 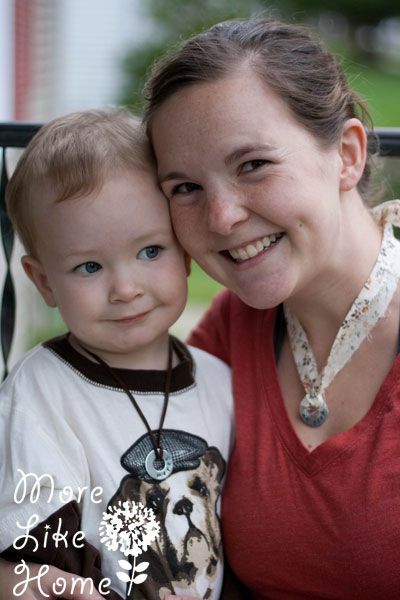 He felt a little better about posing with mama. 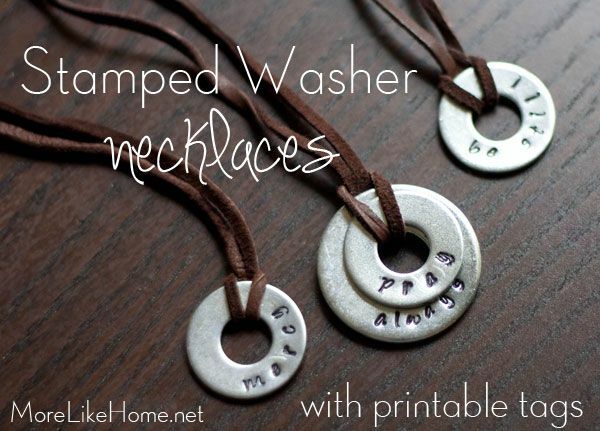 What would you put on a stamped washer necklace? 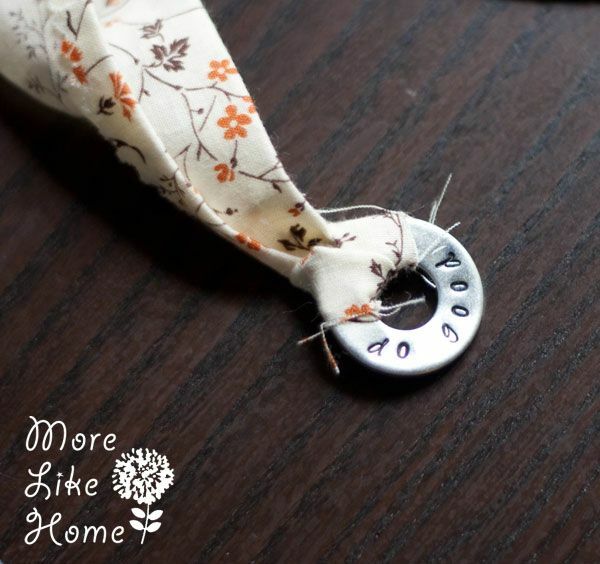 How did you attach the ends of the necklace? I just knotted the ends. 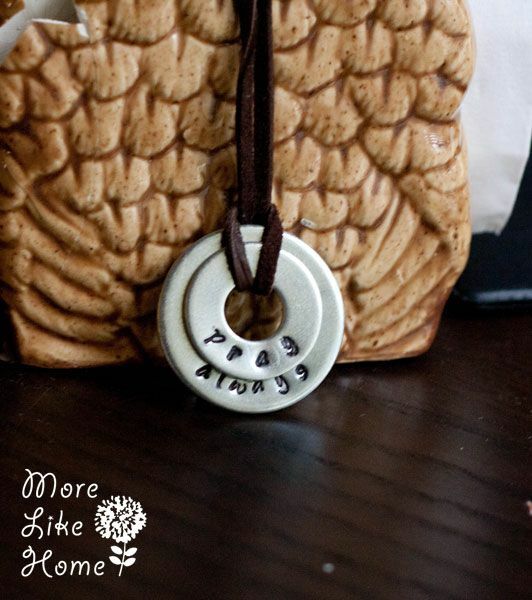 :) You could probably tie the ends to a lobster clasp if you prefer. 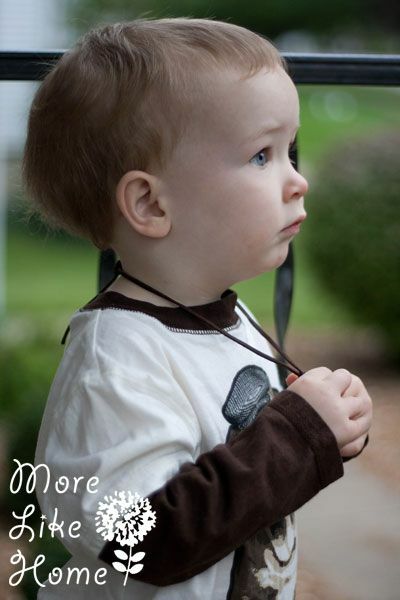 Thanks for sharing your wonderful ideas and passing along the tags! Hi! I'm late to the join tho have a question! 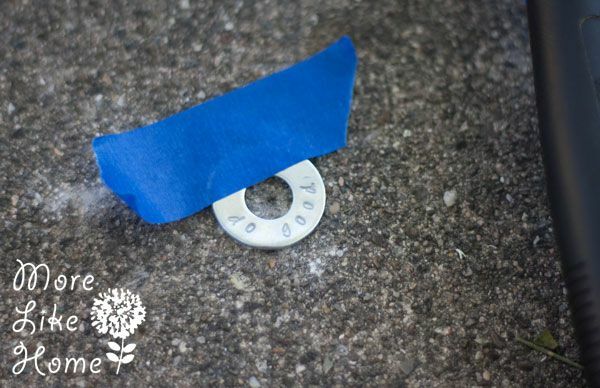 What are the washers you use made from? I purchased some from the hardware store that were made from zinc and not sure of the others though they're so dense they don't stamp.. I even found them hard to "hammer" to made indentations just fainting. I just bought cheap ones at the hardware store too, I'm not sure what they were made of. 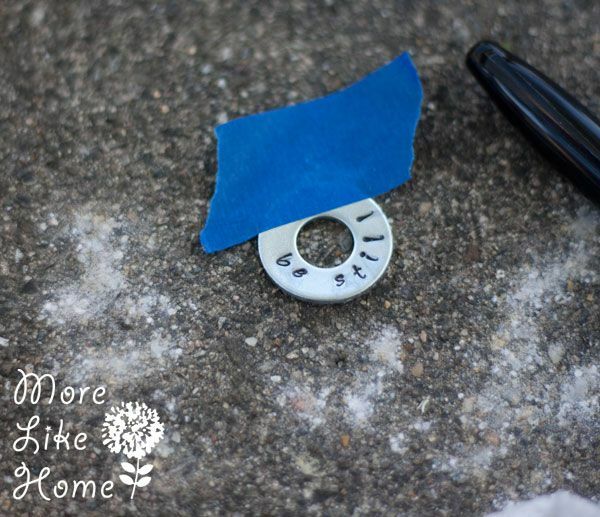 Are you using large washers? 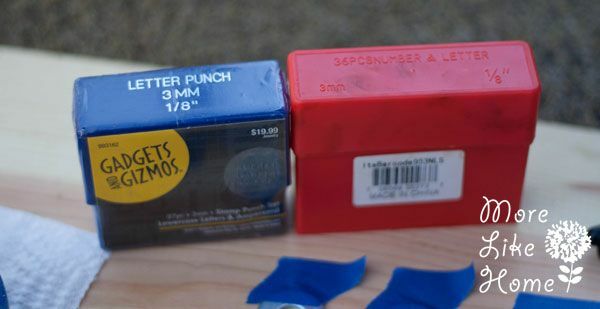 I found the bigger ones took a bit more hammering. The smaller worked a little better. Sorry I don't have more help! Hi indent knowing you'll answer me but I just started this project and my washers are fine but how do you keep them from turning colors from wearing them. I've tried clear coat coverings for metal and it quickly turns. Any suggestions or insight of what to do and to expect? Hi! I'm sorry to say I don't have any advice on that. I guess I haven't worn mine enough to have that problem? I didn't seal them with anything. 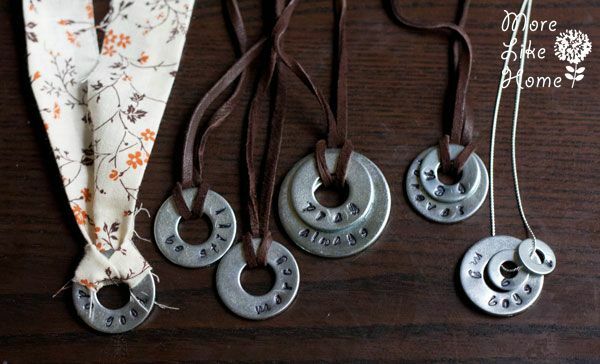 I know most craft stores sell metal jewelry disks for stamping that might be worth a try if you're having trouble with the washers. Hope that helps!